QGIS does have the QCAD plugin. But it is not convenient to be used since it is not a real CAD software. It is limited by the constraints of a GIS software based on points, lines and polygons layers. Drawing directly in a CAD is easier and more convenient. Commercial product already embed such packages such as AutoCAD Map, BricsCAD or Microstation through plugins. There is an almost similar software, JOSM, to draw datas for the OSM project. JOSM is often used to create a drawing to be imported later in QGIS. It would be possible to load a background layer made of georeferenced pictures, or a TMS tiles server or a WMS tiles server. FreeCAD would allow then to draw projects over this layer. ATLAS based on Microstation to draw energy networks. Example for professional use in telecom networks using both FreeCAD and QGIS. * Bringing geospatial engineering in FreeCAD. * Having a solid geospatial engineering workflow thanks to free softwares with a solid reputation FreeCAD and QGIS. * Improving the workflow by making FreeCAD an external serious CAD environnement to QGIS. * Bringing an open geospatial environment for architects, archeologists, mappers, planners or civil engineers. * Drawing complex objects from raster views. * Updating easily maps from raster views. * Drawing energy networks with cotations from surveys. 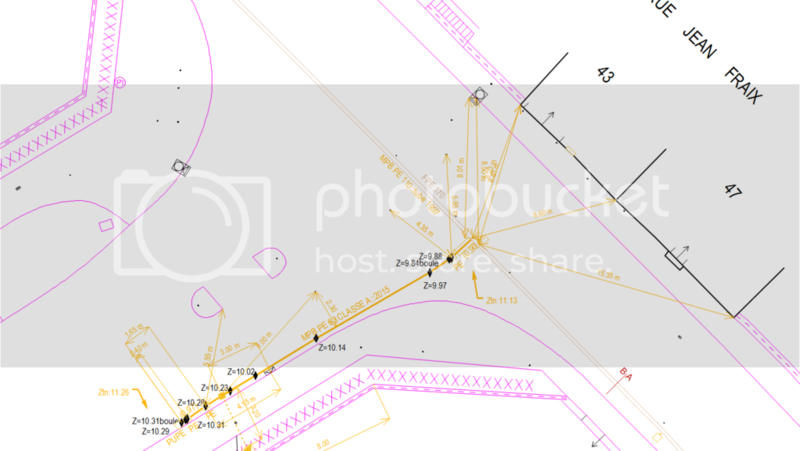 Cotations aren’t exported in GIS, they are kept only with georeferenced DXF. * Drawing all kind of land subdivision for government agencies. * Drawing transport networks maps. The FreeCAD Spatial Manager workbench would draw in 2D only for the beginning. That would make easier to export to a GIS software as well. Based on the features available in JOSM, this workbench would improve the workflow between CAD and GIS in open softwares. Because not everyone is using GIS the same way, the AIM is not to replace JOSM nor to be able to upload datas to the OSM servers, JOSM is already there for that. Anyhow, it will have to be able to respect these features for those who would need CAD features to draw new complex items for the OSM project. 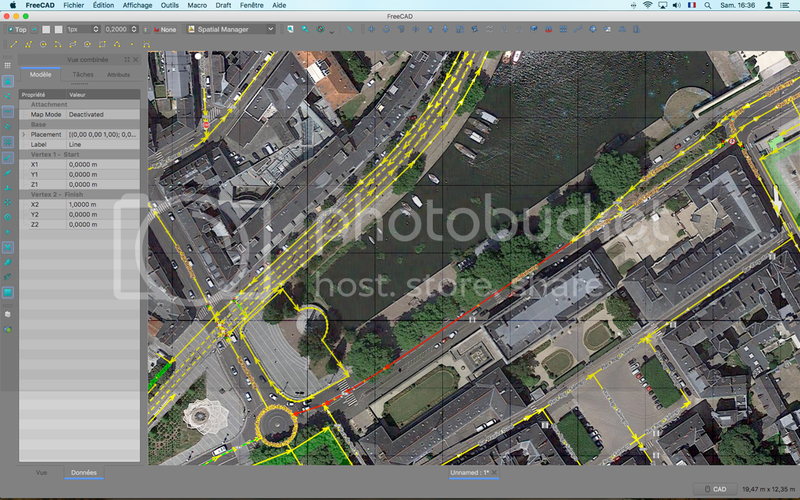 For the OSM users, upload could still be achieved directly in QGIS, or in JOSM by export in OSM. This Workbench would maybe integer the external Geodata workbench which uses OpenCV. Almost the same as Draft Workbench: Line, Wire (Polyline), Circle, Arc, Ellipse, Polygon, Rectangle, BSpline, Point, Bezier Curve. Curves (Circle, Arc, Ellipse, BSpline and Bezier Curve) will have to be converted to Polylines when exported. A level of smoothness can be given further. Add an offset tool. It’s missing a button for the offset tool and a button to select the background tiled layer. The button for the offset tool would be with the draft tools toolbar. Snapping tools are kept the same. The button to select the background tiled layer would be on a dedicated toolbar like this one. The new Attributes tab will be used to input datas to the objects. This is how the interface would look. The new pane on the left with the specific tab and you can see the grid on. The values shown in the attributes tab are from OSM, but any kind of value can be used to fit any GIS project. Just change the key. It’s missing a + and a - buttons to add/remove keys. But a key could be cleared by the contextual menu with a right-click over the one to be removed. Closed shapes such as circle, polygons, rectangles or whatever is closed are filled. We can optionally think about the possibility to connect to a pre-existing SQLite database or an Excel/LibreOffice table where the datas attributes could be stored. Last edited by M-Rick on Sun Jun 03, 2018 3:20 pm, edited 1 time in total.